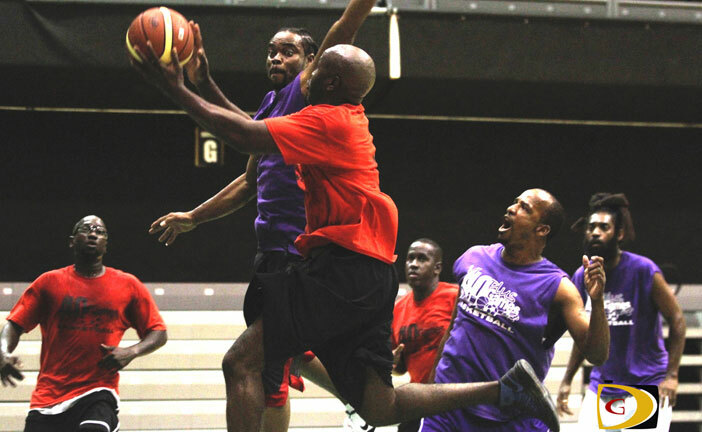 When the 40+ Basketball League two unbeaten teams clashed on Saturday night, the East Wolf Pack had designs on winning the title and the Virgin Gorda Mystics came with a plan to shut them down. The Mystics executed their strategy to perfection. The Mystics opened with a 12-0 run after Wolf Pack started the game with a 3-pointer and they never trailed again during a 46-26 blow out victory that gave them the top seed heading into this weekend’s one game playoff against Unity. As the Mystics began running away with the game early in the first half, Wolf Pack couldn’t get any shots to fall, committed numerous turnovers while the Mystics dropped in outside shots, out hustled and out rebounded their opponent to build their lead and control the game. Mystics led 19-12 at the break then opened the third quarter with a 6-0 run for a 13 points 25-12 lead before Wolf Pack finally scored in the paint. The Mystics ended the third quarter up 27-16. Mystics’ William “Ice Willy’ Penn who guarded Thomas was instrumental in holding him scoreless when he had been averaging almost 30 points per game after opening the league with 39. Disappointed Wolf Pack coach Vancito Pickering, declined to comment on his team’s anemic performance. Hilroy “Bongo” Warner was the Mystics’ leading scorer with 15 points and three steals. Jeff George follow up with 12 points and seven rebounds. Marcus Hawley and Terry “Federal” Turnbull had seven points each for the Wolf Pack. In the other game, David Archer scored 19 points to lead the Disciples to a 54-47 triumph over Unity. They will face the Wolf Pack for a spot in the title game against the Mystics vs Unity winner. Ronford “Eagle” Todman contributed another 15 points. Keith “88” Malone had eight rebounds, dished out seven assists and finished with four points. Alford Greenaway led Unity’s scoring with 14 points and eight rebounds. Lloyd Willis added 13 points and five rebounds while Clifton “Mackadoo” Corum and Allen Brewley added eight points respectively.